Late next year, there will be a new object in the night sky nearly 10 times brighter than the full moon. This temporary attraction, called C/2012 S1, is a comet that has likely never passed through our inner solar system before, so it’s larger and more reflective than those our sun has already blasted. C/2012 S1 won’t just be bright; it’ll be large enough to see without the need for binoculars or a telescope. Its brightness magnitude is expected to be -16, with the Sun by comparison being -26. 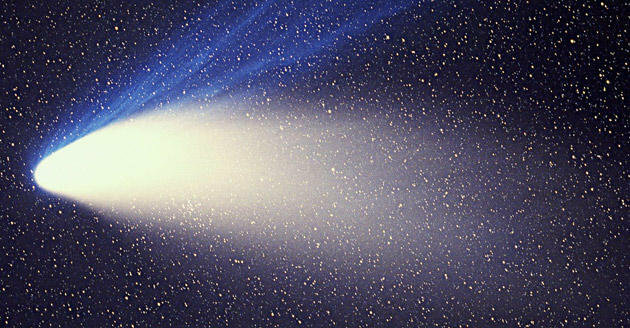 Comet Hale-Bopp, seen above, was magnitude -1 when it passed through our solar system in 1997. Astronomers are predicting that C/2012 S1 will appear in the sky near the sun and horizon, so it should be fairly easy to pinpoint without a sky map. Should it contain a large amount of gas beneath its icy exterior, the comet could sprout a massive glowing tail as it nears the sun and the ice is melted away, making it even easier to see — not to mention much cooler looking. Scientists tracking C/2012 S1 have pointed out that the comet’s brightness isn’t entirely guaranteed, but even if their estimates are off it should still be visible to the naked eye. That wasn’t the case with Kohoutek, a comet that entered our solar system in 1973 and was expected to be brilliant in the night sky, only to disappoint because it turned out to be mostly rock and not highly reflective ice. Previous: JK Rowling’s “The Casual Vacancy” Goes on Sale! Next: Reese Witherspoon Welcomes a Baby Boy!